Jenny is a working Mum of two based in South London who has a real love of neon and all things interiors. After revamping her house and failing to find some affordable neon to light up an industrial style room, she decided to make her own neon style artwork and thought that other people might like to do the same. 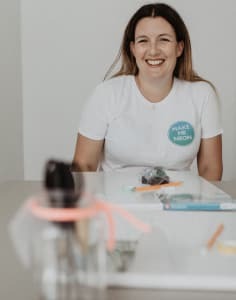 She decided to set up Make Me Neon when she returned to work after having her second child and realising she didn't quite have the same passion for her 9-5 as she had done for the last 12 years. She has considerable experience of running workshops and training events as part of her 'day job' and thought it was about time she used those skills for something she was passionate about. Her classes are totally relaxed and you're encouraged to be as creative as possible as almost anything is possible in neon. You don't need to be very creative or artistic as she comes armed with plenty of templates for you to use - you just need to want to create something fabulous in neon. If you have any questions about the class then drop Make Me Neon a line using the ‘contact host’ button. Last night I did my first Make Me Neon class. The teacher Jenny was so thorough and helpful in the process of making our neon art on canvas. It was such a fun and relaxing atmosphere and the time flew by. I absolutely love my neon creation. I’m looking forward to doing another class soon. I loved last night's class, I haven't done anything like that before and it made a nice change from just meeting friends for dinner or drinks. We still got to have some bubbles and a good gossip, but we also came away with something really cool to keep! Jenny, the teacher, was super friendly and approachable and made the whole experience really light and a lot of fun. I'll definitely go back and do this again with other friends, but it's also given me the confidence to try other classes. I had such a wonderful time at the Make me Neon class this week. I really wanted to do something creative and saw this class which was perfect as I love neon and it was nearby. I came on my own and Jenny made me feel really relaxed with a glass of prosecco and introduced me to everyone in the class who were lovely. Jenny is a great teacher and really knows her stuff. She didn’t mind me asking lots of questions. I really enjoyed making the artwork and absolutely love the finished art. The venue was really nice and relaxed and it was a really fun night out. I’m tempted to come back and maybe bring a friend next time so I can make another piece of art for my dining room. Thanks Jenny. Great to do something creative and fun on a Monday evening. My son loves his neon guitar! Instructions were clear and venue was lovely. Jenny was a great teacher - very friendly and supportive. We learnt to make neon art work using canvass frames to sew neon lights into our favourite shapes. You don't need to be arty, as there are templates you can follow. It was the most fun I have had crafting in a long time and you have something really nice to take home with you. Jenny teaches you so well you can easily do it yourself at home. I'm thinking about making my nieces some neon artwork for Christmas! I've always thought of myself as lacking in artistic qualities/experience and I was reluctant to attend this class. I was mainly anxious about not being able to get a good product. However, this class has changed my mind and I now know that this class is for ANYONE! the designs are simple and can be adapted to whatever you want. I also found that the neon does not need to be completely exact for this to work. I was really impressed with the teacher, Jenny, who was patient, encouraging and very helpful. The Make Me Neon class was so enjoyable that I will definitely do it again. The tools provided also give the learner the chance to try out their own styles at home. Really impressive and if I could give more than 5 stars I would. Highly recommended for parties/hen dos/staff bonding. What a great workshop! 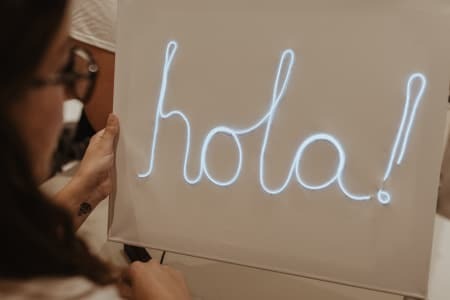 Relaxed and enjoyably creative class, with a unique and personalised neon sign to display at home at the end. Jenny was excellent as our host and guide, and the gallery at The Exhibit was a perfect venue. Highly recommend! In a few hours we learnt how to make our own neon sign - the class was such fun and really well taught - highly recommend! I had such a wonderful evening at Make Me Neon last night, thank you so much Jenny! Everything was brilliantly explained and even I managed to make something i’m proud of! Everyone should do it!!! Great teacher and super nice experience! Igot an amazing xmas gift!